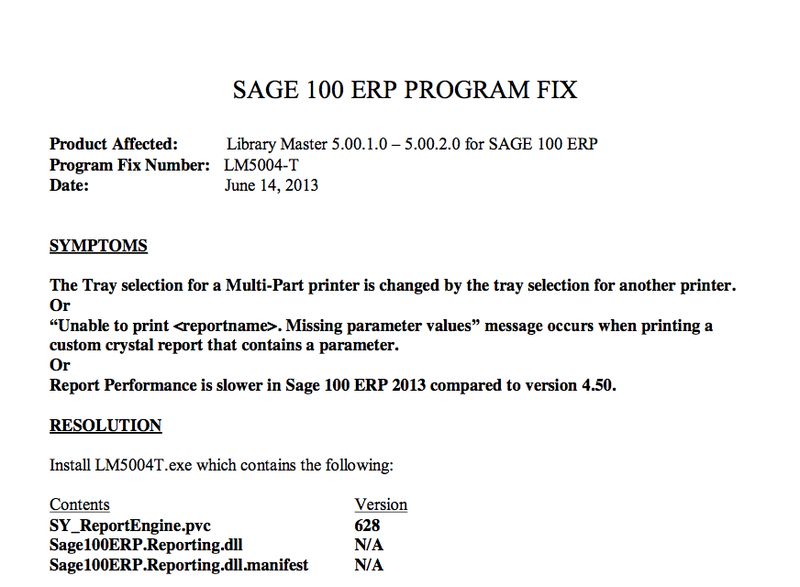 Sage have just issued a patch for Sage 100 ERP 2013 which they say resolves various printing issues including reports that printing under Sage 100 ERP 2013 was noticeably slower than prior versions. This issue appears to have occurred within accounts payable check printing but some users have reported slow printing in other areas as well. UPDATE JUNE 17, 2013: This patch was pulled for a minor correction. 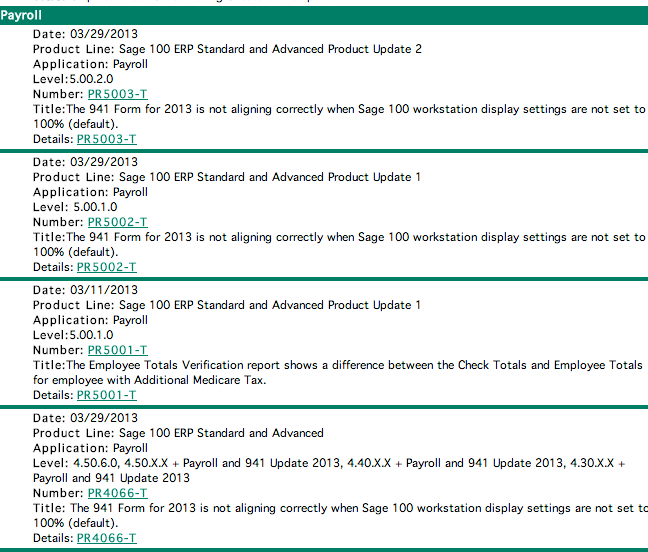 When installed some users were noticing that their version of Sage 100 ERP was showing an incorrect product update level. If , for example, you had installed Sage 100 ERP 2013 product update 2 – after you applied this hotfix your system would be showing you’d only applied through product update 1. This is purely cosmetic. Expect the hotfix to be reissued shortly. Sage have just issued a program patch for versions 4.3+ of Sage 100 ERP which corrects an issue some users have encountered trying to print the 2013 IRS form 941. It appears the original issue relates to the report itself which would resize the fonts incorrectly when the workstation display settings were NOT set to 100% (default). Various MAS90 and MAS200 ALE lookups that filter by customer number are blank or do not filter correctly (FIXED). Several users have reported in MAS90 or MAS200 version 4.4.x.x that the customizable lookups sometimes were returning blank records. 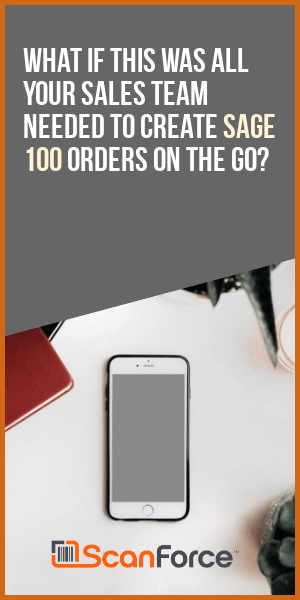 One example was when a customer lookup was done in sales order INVOICE data entry that the SHIP-TO code lookup was returning blank data. Some consultants were able to fix this by running the ALE rebuild utilities. Others found that the utility did not resolve the open issue. At first Sage reportedly promised a fix for Product Update 7. Now it seems cooler heads have prevailed and Sage published an independent hot fix last night on their web site. You may have tried recently to download the latest FRX service pack 11 from Sage. Unfortunately as of January 31, 2011 Sage is no longer able to distribute service packs due to Microsoft (who publishes FRX) discontinuing sales of FRX (support however extends to December 2012). If you need to download FRX 6.7 Service Pack 11 (aka R11670) you can navigate directly to the Microsoft Knowledgebase via the link below.